X-ray images of the Perseus galaxy cluster taken by Japan's Suzaku spacecraft, shown in two false-color strips. Bluer colors indicate less intense X-ray emission. The dashed circle is 11.6 million light-years across. Red circles indicate X-ray sources not associated with the cluster. Inset: An image of the cluster's bright central region taken by NASA's Chandra X-ray Observatory is shown to scale. A Japanese space observatory has revealed the clearest view yet of the dusty Perseus galaxy cluster 250 million light-years from Earth. The new observations were taken in the X-ray range of the light spectrum by the Suzaku spacecraft, whose name is Japanese for "red bird of the south." They reveal the galaxy cluster's size, mass and chemical content in unprecedented detail, researchers said. 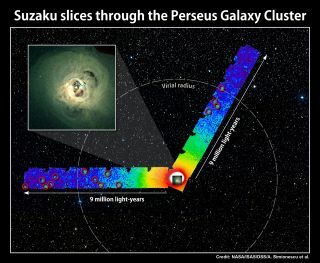 Based on Suzaku's measurements, the Perseus cluster is 11.6 million light-years across and contains more than 660 trillion times the mass of the sun. That's nearly a thousand times the mass of our own Milky Way galaxy. "Understanding the content of normal matter in galaxy clusters is a key element for using these objects to study the evolution of the universe," said study co-author Adam Mantz, of NASA's Goddard Space Flight Center, in a statement. The study should also help astronomers better understand the distribution of "normal matter" — the stuff we can see and detect — and the strange, elusive dark matter that makes up far more of the universe. "The distribution of these clumps and the fact that they are not immediately destroyed as they enter the cluster are important clues in understanding the physical processes that take place in these previously unexplored regions," said Steve Allen of the Kavli Institute for Particle Astrophysics and Cosmology at Stanford University, the principal investigator of the Suzaku observations. The researchers report their results in the March 25 issue of the journal Science.